I haven’t done much here with progress pics — Sue and I share this space, and writing endless little posts about the bits of progress we make on a daily basis never appealed to either of us. Lately, I’ve been sharing individual WiP pix on Instagram, but this week I found myself with a bundle to share. First up: Celtic Yule (nee Christmas). This is on white monaco, which is a 28 ct cotton fabric. I’m stitchin over two threads, with two strands of DMC cotton flosses for cross and quarter stitches, and one strand for backstitching. 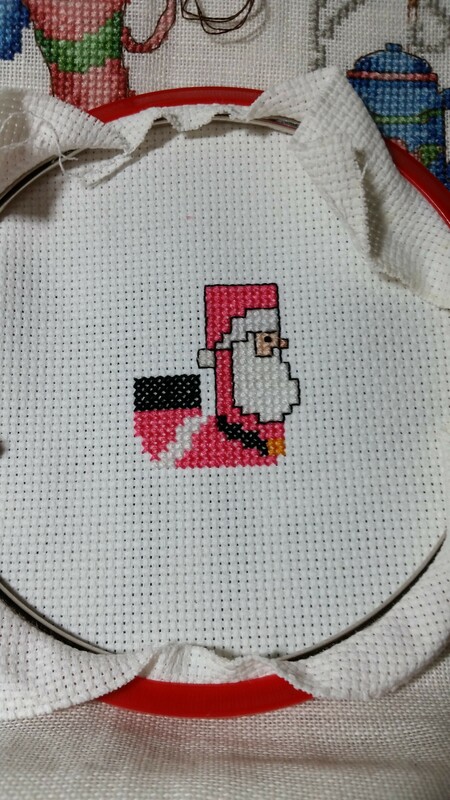 I’ve been working from left to right on the top half of this one and have the poinsettia’s cross stitches nearly done. 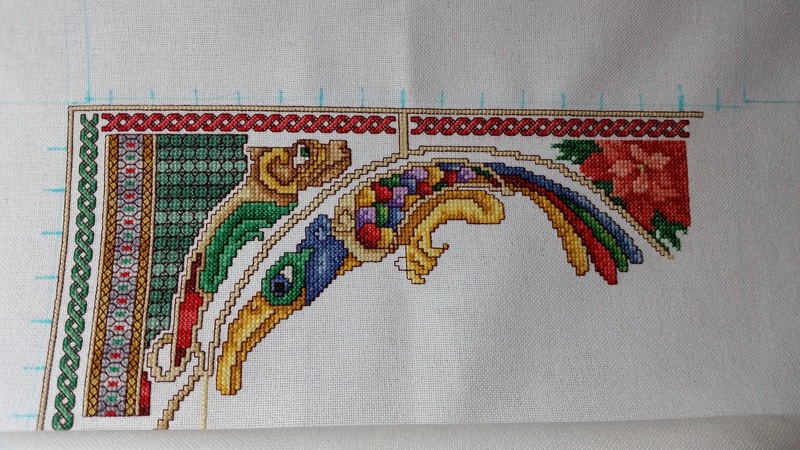 Next time it goes up on the stand, I’ll be doing a lot of backstitching. I have said it many times: I love the palette of colors Mike Vickery uses. It’s distinctive to my eye now, after completing two of his designs previously (I see I’ve got neither of them available here — I hope to fix that soon). After this one, I’ll very likely buy another to dream over for a bit — they’re addictive. Next up: Caffiene Fix. Sorry for the blurry corner there. Linen is hard to stitch on, too. 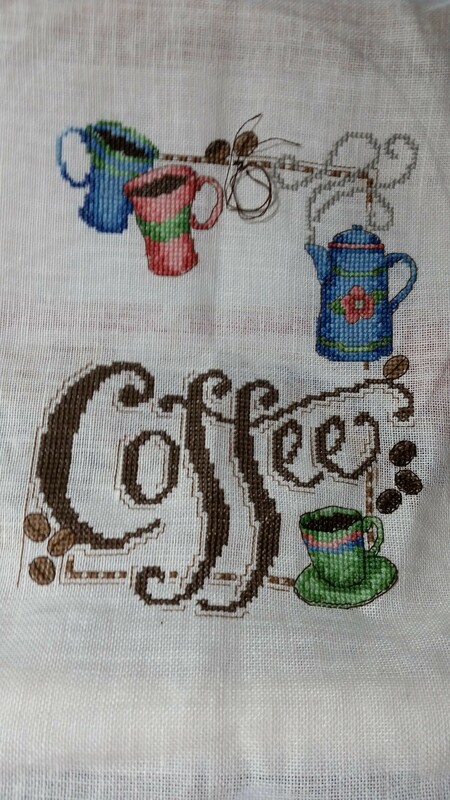 This 28 ct Irish linen, again stitched over two, DMC floss, two strands for cross stitches, one for back stitches. Originally, I liked the “illustrated” look of this, and I still do — but I’m finding the back stitching in this one tiresome, I have to admit. I only work on this one during elder care times. It’s one of the few things my mother in-law actually, visibly, and verbally likes every time she sees it — and it’s new to her every time, too. As much as I disliked her personally when she was still sane, she was one of the few people I knew personally who understood the effort it took to stitch something by hand, and always appreciated it when I gifted her with something I’d stitched. So, we have that, at least. My dream is to get this finished and framed in time to take it down to the Stitch & Pitch at AT&T Park on July 18th of this year, and find a way to get it to the team, somehow. The obstacles to seeing this one come true are many, but for now it’s just a matter of getting through the stitching. 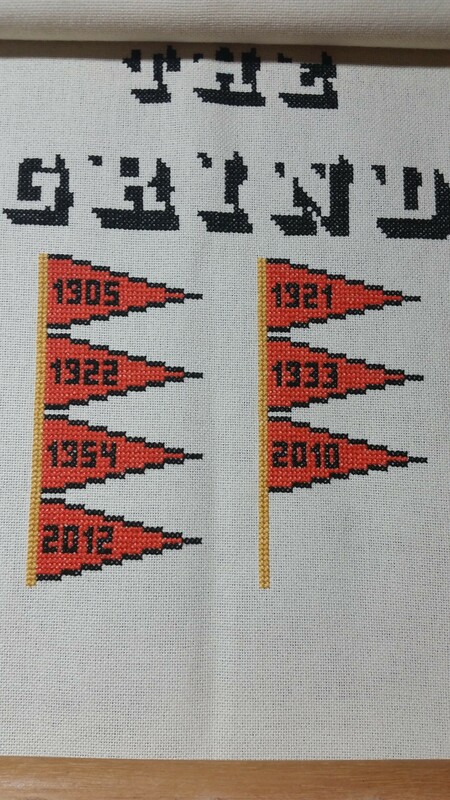 I almost feel like I cursed the guys by designing and stitching this for them this year, which has been awfully grindy already — culminating in that 17 inning marathon last night, that they won with Buster Posey’s walk-off homer. It’s super hard to trust that grind when you’re in the middle of it, but it’s really the only way to get through it. Last up is the family tradition stuff. I’m getting started on the “Contortionist Santa” ornaments early this year, since I’ve got to do four J’s and one K, and the best times to squeeze these in is when the baby dragon is down for her nap. The baby dragon is my great granddaughter. My elder son is joining his life with a woman who’s got three kids of her own, and a baby granddaughter. That’s how I got a great-granddaughter before I really had much practice being a grandmother. I offered to difference the J’s by color. They all like pink best. facepalms I made my peace with pink a few years back, but really…. These are done on 14 ct aida. I used to do them on Rib-bands, but I’ve got some better ideas on how to finish ornaments now. They stitch up quickly, which is good, because that little girl doesn’t always sleep for long, when she goes down. The last project I’ve got going is a Maleficent-inspired design I picked up on Etsy, but I’ve made a mistake in counts and have some frogging to do before I get a pic of it.